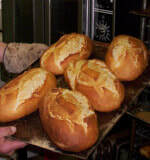 Located opposite Fort Anne National Historic Site in Annapolis Royal, the bakery is the dream of Heidi and Dieter Claussing, formerly of Fraureuth, Germany. 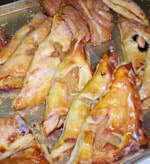 Open year round, the bakery features German baked goods from sweets to breads and numerous specialities. The Café and Restaurant, alongside the bakery with indoor/outdoor seating, features German café style breakfasts,luncheons and dinners, always utilizing the finest from the bakery and local suppliers of produce, meats and beverages. The Café is open year round with the exception of family holidays. From biscuits to pigs ears, schnitzel to bratwurst, come enjoy a leisurely lunch or dinner in the indoor/outdoor style café followed by a visit to one of the many historic attractions in town, all within walking distance. Heidi and Dieter will welcome you daily, along with their daughter Susanne. And say hello to them at the Annapolis Valley Farmer's Markets in Annapolis Royal and Wolfville where they offer goodies throughout the Spring, Summer and Fall. 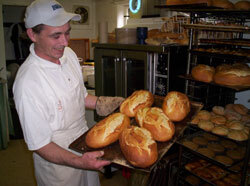 Dieter, baking since 1980 in Germany, became a Baker Master in 1986. 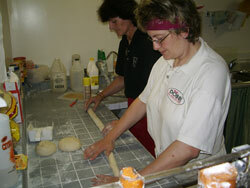 Heidi as well has been baking since 1980 specializing as a Pastry Chef. They took over Heidi's mother's business in 1989, a baking enterprise located in Fraureuth, Sachsen, Germany; a business that was in the family for over 70 years. Heidi and Dieter also worked for four years in a huge bakery serving 54 stores in and around the Mulheim, Germany area, before moving to Canada. The Claussing family team works well together, Heidi and Dieter spending long hours in the bakery, and Susanne (Hotel Management from Holland College) manages the Café as well as staffing the local Farmer's Markets. The Claussing family is proud of their ancestry and the fact that they still bake using the old recipes from grandparents, everything is made without preservatives. 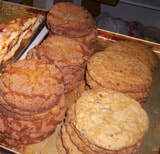 In the Spring of 2012, the bakery expanded and moved into its new location on St. George Street opposite Fort Anne National Historic Site, still in Annapolis Royal.